Airplane Kills Jogger: Story Offers Example of Importance for Estate Planning | The Levin Law Firm - Philip Levin, Esq. Most everyone in the country has heard about the Georgia husband and father, Robert Gary Jones, who was killed by an airplane while jogging on the beach on Hilton Head Island, South Carolina. This accidental death will no doubt spur a lawsuit against the pilot of the plane, Edward I. Smith. Did Mr. Jones have a will or trust that would help save taxes and protect his assets for the benefit of his family? Did he have sufficient life insurance to provide support for his wife and young children, including college education for the kids? Had he discussed his wishes for funeral arrangements and disposition of his remains with his wife? Does Mr. Smith have sufficient liability insurance coverage to pay the damages that will be demanded from Mrs. Jones? Did Mr. Smith arrange his assets in a way that will help protect him and his family from the devastating effects of a wrongful death lawsuit? This event is an example of the fact that one never quite knows what will happen, including a sudden death. 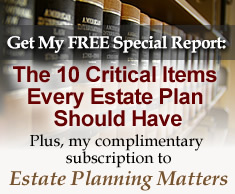 Don’t leave yourself and your family exposed – contact an estate planning attorney today. Preparation may not prevent incidents from occurring, but it sure can ease the effects of the aftermath.